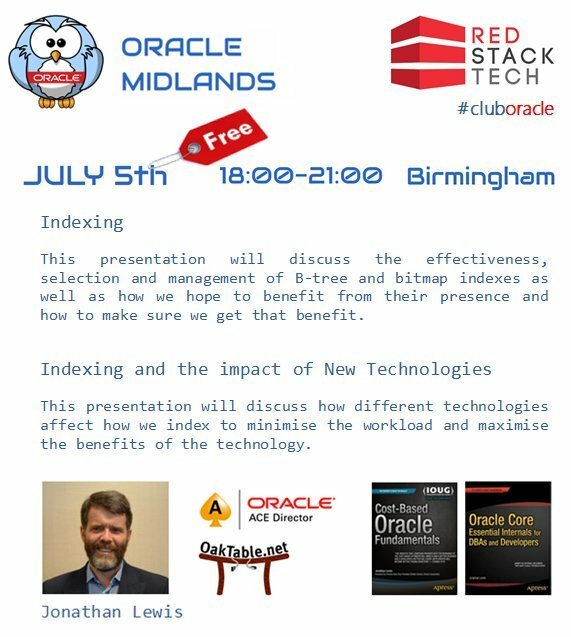 Don’t forget Oracle Midlands Event #18 next week! If you live near, please show your support for the event and come along. It’s free thanks to the sponsorship by RedStackTech. Having spent the last two weeks at Oracle OpenWorld 2016, what’s the obvious thing to do within a couple of days of getting back? Go to Oracle Midlands to hear more about Oracle 12c Release 2 of course! Dominic’s session was a romp through some of the 12cR2 new features and enhancements. With allegedly 500+ new features in 12cR2, not all of which are documented yet, there was a bunch of stuff I hadn’t already heard of. Dominic is relaxed and super-confident in his presenting style. That combined with the huge list of new stuff knocked my internal 12cR2 hype-meter up a few notches. There is so much new stuff it is really daunting, but exciting too. As the name suggests, Nigel’s session was also about new features, but focussed on the optimizer. With finer grained control over the adaptive features and more conservative defaults in this regard, I think a move from 11gR2 to 12cR2 will be less of a mystery than the switch from 11gR2 to 12cR1 was for many people. 🙂 The session actually covered most of the 12cR1 optimizer features as part of the setup for what’s changed in 12cR2, which I thought worked really well. Nigel is also a confident speaker, with a laid back approach and midlands accent, which of course makes him a superior presenter! 🙂 Once again, my internal 12cR2 hype-meter got knocked up a few more notches! Big thanks to Dominic and Nigel for coming to speak to us. Thanks as always to Red Stack Tech for sponsoring the event, allowing it to remain free, and to Mike for organising it! 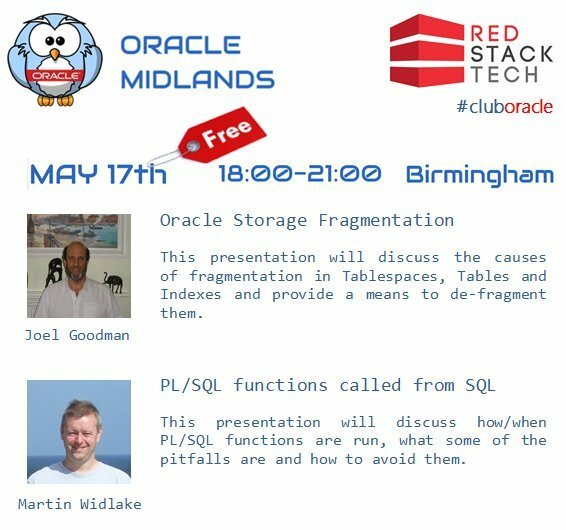 Last night was Oracle Midlands Event #15 with Joel Goodman and Martin Widlake. First up was Joel with a session called, “Oracle Storage Fragmentation”, where he discussed the potential fragmentation issues possible in tablespaces, tables and indexes. If you’ve been a DBA for a long time it’s easy to think everyone knows this stuff, but I get asked questions about this stuff a lot! The session had a good mix of content, with something to keep everyone happy from beginner to old timers. Joel is like a walking encyclopedia of Oracle, so it’s always good to hear him present. Thanks to the guys for coming to speak to us and to everyone that came along to the sessions. Thanks to Mike for doing a great job in keeping Oracle Midlands going and to Red Stack Tech for their continued support. Last night was Oracle Midlands Even #14 with Lothar Flatz. The session started with “Raiders of the Data Dictionary I: Indexing for the Workload” where Lothar discussed a project he worked on based around completely revamping the indexing of a system. I guess the best way I can describe it is to say it’s a more scientific approach to indexing, using the contents of the dictionary to provide information about columns and column groups used in queries to determine the indexes to create. In some ways the approach was quite extreme (throw everything away and start again), but I also admire the bravery of that approach! 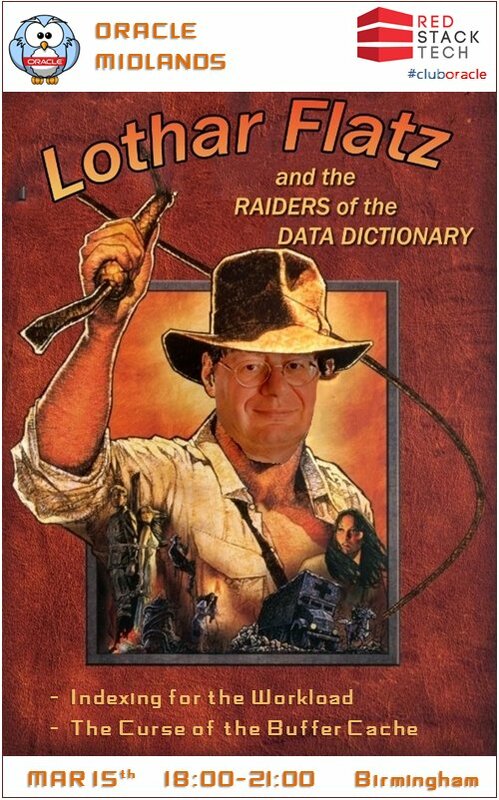 Next up was “Raiders of the Data Dictionary II: The Curse of the Buffer Cache” where Lothar discussed the problems associated with trying to keep large, frequently used tables in the buffer cache. Once again, some interesting points made and some things that will definitely influence my approach in future. It was great to meet Lothar in person for the first time. After being in the game for 20+ years many subjects can start to feel a little repetitive, so it’s nice when someone comes along with a different spin on a subject. I certainly found myself asking a lot of questions of him and myself, which surely must be what this knowledge spreading thing is all about! Thanks to Lothar for taking the time to come and speak to us and to everyone that came along to listen. Thanks to Mike for doing a great job in keeping Oracle Midlands going and to Red Stack Tech for their continued support. Tomorrow is Oracle Midlands Event #14. 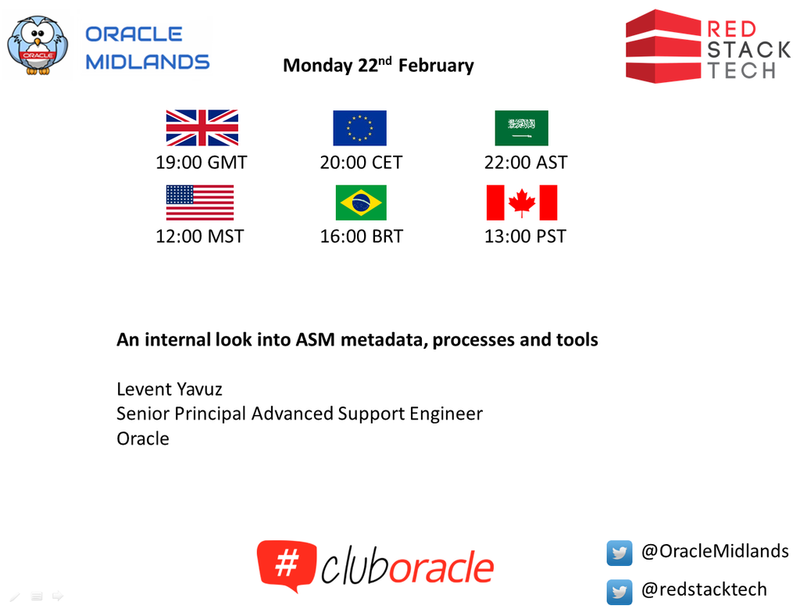 Just a quick reminder about tonight’s Oracle Midlands Webinar. Tonight was Oracle Midlands Event #12 with Bryn Llewellyn and Neil Chandler. Bryn very kindly stepped in for Tom Freyer who unfortunately couldn’t make it. Bryn’s presentation was called Why use PL/SQL?, which was based on his whitepaper of the same name. I’ve written about a number of the topics he raised, including a piece on My Utopian Development Environment, but his talk and his whitepaper put forward a much more consistent and compelling argument. Definitely worth checking out if you are a PL/SQL expert or newbie! Along the way, he used a little piece of syntax I have never noticed before, which has been available for the whole 20+ years I’ve been using PL/SQL. I’ll write about that in a post tomorrow if I get chance. Both guys will be presenting these sessions at UKOUG Tech15 if you want to catch up with them! Thanks to the guys for coming to speak to us. Thanks to Bryn’s mom, for living in the UK, giving him an excuse to come to UKOUG Tech15 early and therefore be available to step in at short notice. Thanks as always to Red Stack Tech for sponsoring the event, allowing it to remain free, and to Mike for organising it! Last night was Oracle Midlands event #11 with Chris Antognini. Chris did two talks at the event. The second session was pretty neat too. I must admit I’ve become addicted to the Enterprise Manager 12c performance pages, so a couple of the things Chris mentioned took me by surprise, including the use of some V$ views that I assumed were part of the Diagnostics and Tuning Pack, but aren’t. I’m purposely going to avoid mentioning them here because I would want to confirm the status before accidentally leading someone astray, but the idea was, query the V$ view and you are good. Query the DBA_HIST_* view and you’ve sourced the information from the AWR, so you need the D&T pack. This definitely *does not* apply to all V$ views, but it’s worth checking out if you don’t have D&T, or you are working with standard edition.